When someone mentions grandfather clocks, we usually think of antique clocks such as those made by Howard Miller or Kieninger. Though grandfather clocks have always had a traditional design, more and more manufacturers are shifting to a more modern design for their grandfather clocks. The guys over at grandfatherclocksblog even has a list of non-traditional grandfather clock design such as clock towers and street-light designed grandfather clock. I've even seen a Howard Miller Oasis Fountain Water Grandfather Clock. Who would have thought that Howard Miller would go beyond their traditional design. But then, there's modern, and then there's the REALLY extraordinary. 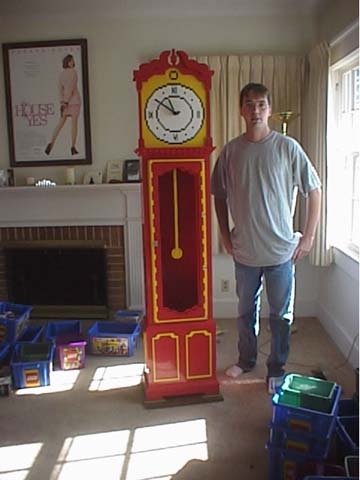 Like this Lego grandfather clock that Eric Harshbarger made. Wow! All I can say is, this guy really has a LOT of time in his hands. I know that there are a lot of Lego fanatics out there trying to build different things but this is the first time that I've seen a Lego Grandfather Clock. Like what Eric mentioned in his website, this clock is ALL Lego, even the gears, axles, and pendulum. Eric's Lego grandfather clock will run 13 hours before it has to be reset. A pretty good achievement considering other guys who made Lego clocks can only make theirs run for a couple of hours. All I can say is—WOW!